It’s my first day in Sydney, I must waste no time. 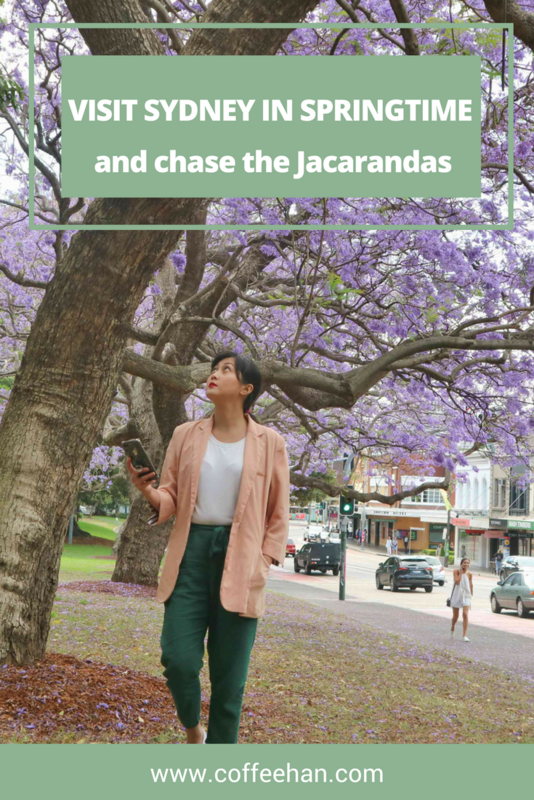 As soon as I finished checking in at Home Backpackers Hostel, I left to roam the city in search of the trees that yield purple flowering plants; the jacarandas. Jacarandas are commonly found in countries like Argentina, South Africa, Zimbabwe, Spain, Zambia, Nepal, and Australia. The name comes from the Guarani language—an indigenous South American language—which means “fragrant”. In Australia, Jacarandas bloom in springtime, October to November. I went in November, just in time to appreciate these beautiful purple blooms. 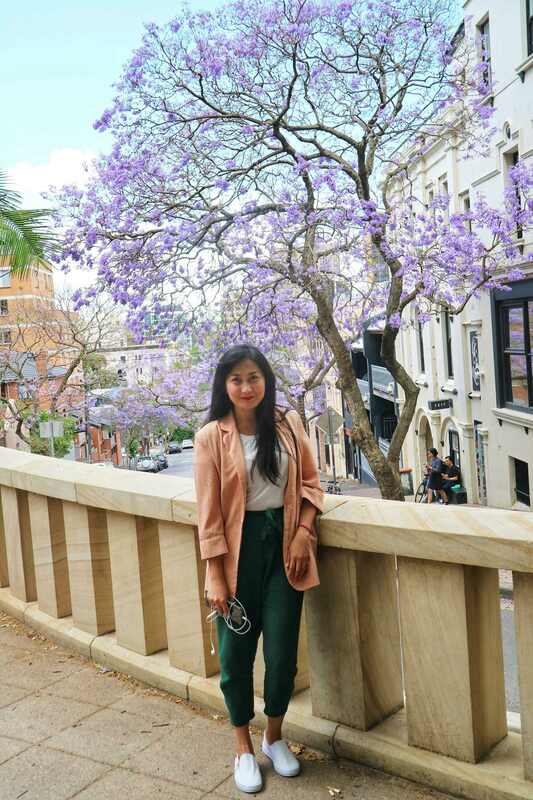 Days before this trip, my friend sent me an online article that showed some Asian tourists stopping traffic in Sydney for that perfect Instagram-worthy photos with the jacarandas. 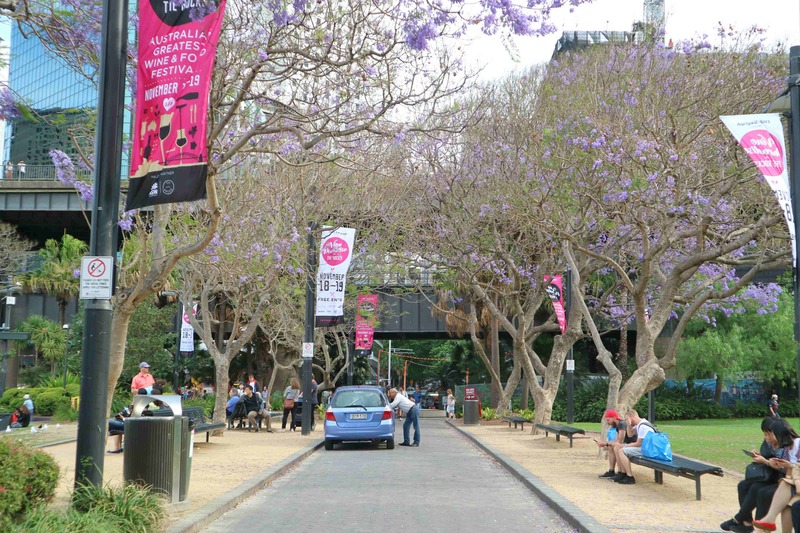 Don’t worry, I didn’t cause a traffic, but I managed to find some of the best spots for some jacaranda appreciation in the Central Business District (CBD). I wanted to hit myself in the head because I knew I would be alone yet I left my tripod in the hostel. 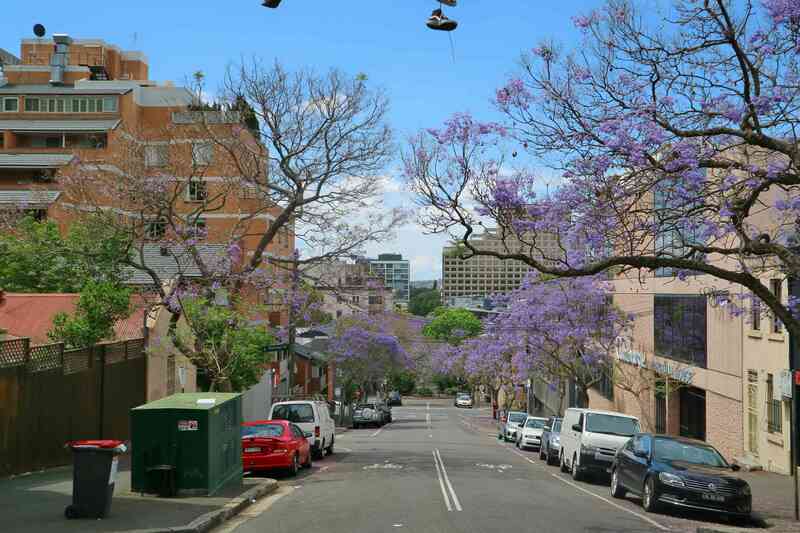 So when I had my first sighting of the jacarandas in Riley Street (click here to see the Google Maps street view). I had to muster the courage to ask strangers to take my picture. I looked around and saw a couple walking the street and I heard them in speaking in Tagalog. Yay! My kababayans! I followed them and specifically asked the woman to take my photo. They continued walking as if they didn’t hear me so I tailed them like a stalker. I repeated myself until they couldn’t ignore me anymore. The woman looked at me and said, “Akala namin Chinese ka kaya dumiretso kami.” (We thought you were Chinese so we went ahead.) I honestly don’t know what to make of that statement. I mean, I should have been relieved that they didn’t ignore me completely, but somehow, it didn’t feel right that they ignored me at first because they thought I was Chinese. I think my thoughts are reflected in my not-so-natural smile in the photo. I want to give them the benefit of the doubt, maybe I misinterpreted the remark? I’m not sure. With Google Maps, I set off to my next destination. Sydney’s primary nightclub strip, Oxford Street, is where I found the loveliest jacarandas trees. I spotted other tourists taking in the view, including a woman whose hair was dyed purple. I didn’t take a picture of her even if I wanted to because you know, decency. 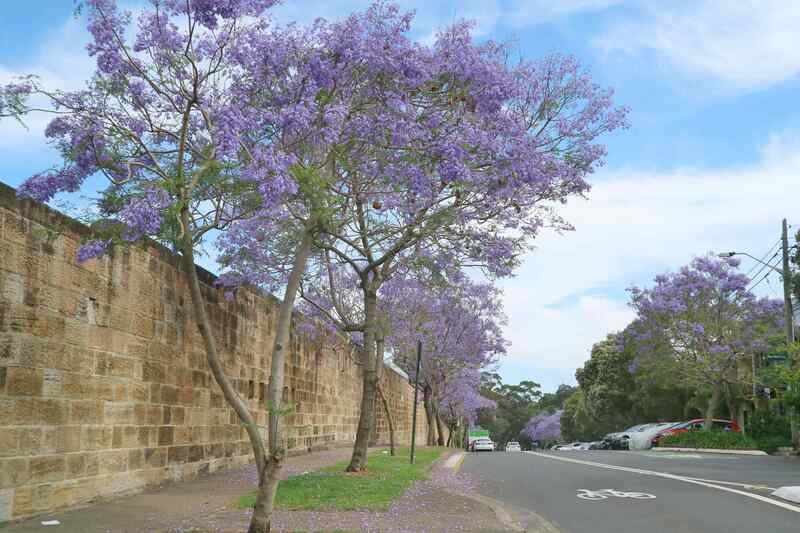 As I walked along Oxford, contemplating where I should head to next, I saw more jacaranda trees right outside the walls of Victoria Barracks, an Australian Army Base. I saw more jacarandas for the rest of my stay in Sydney because they are practically everywhere. 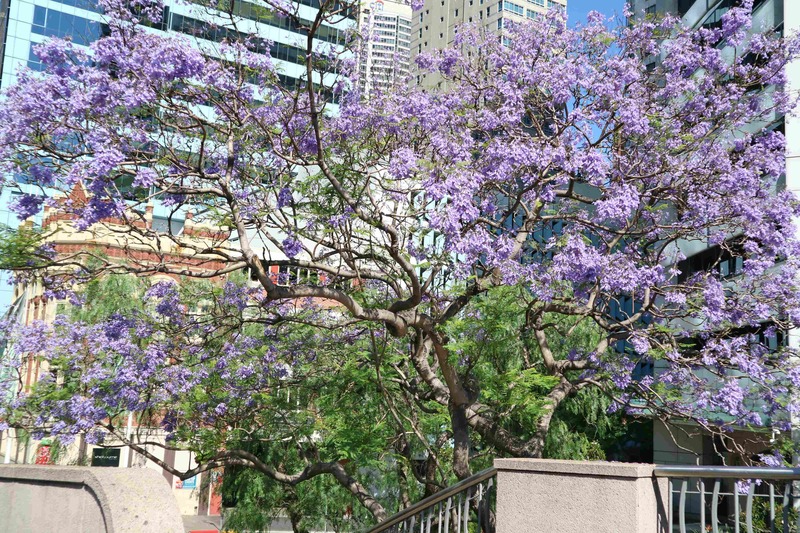 There are also jacaranda trees, albeit few in Darling Harbour and Circular Quay. It is worth noting that I didn’t have to go beyond CBD to find the jacarandas. The whole city is swathed in lavender this time of the year that you don’t even have to try too hard (or stop traffic) to seem them. I was tired from the flight and the thought of just sleeping in the hostel did come to mind, but I didn’t give in to my lazy tendencies. Finding the jacarandas was the highlight of my first day in Australia and I’m glad that I stayed up for them. 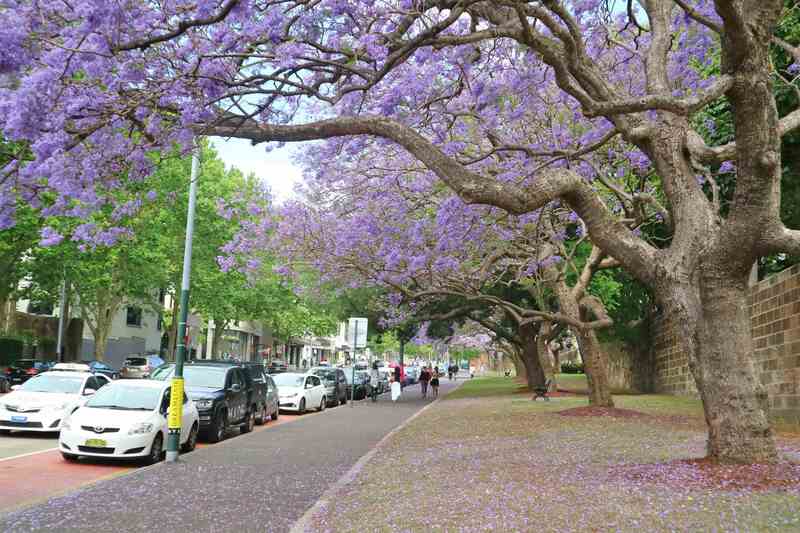 Do visit Sydney in springtime when they are in full bloom. it inspires me more to visit Sydney in the near future. your pictures are awesome as they have purple touch due to those purple trees. Oxford street reminds me a place in Seoul where sakura blooms. Wow, reading this post made me remember my friend, whom I didn’t see for quite long already. She really loves purple color and if she would be really happy to amble around here. Honestly, I haven’t heard about Jacarandas before and it looks like really magical and interesting. If I were there, I would never get tired of gazing to its innate beauty. I also wonder how it smells like, it must have soothing smell. I wish to visit Australia and get to see this, It’s really beautiful. I am a huge fan of flowering trees. They’re gorgeous! I haven’t been to Sydney yet, only an airport stopover which doesn’t count so I don’t really know how to interpret the reaction of the kabayans you saw. So far, I have noticed, overseas Pinoys’ openness to fellow kababayans differ from each place I have been. Wow so beautiful! I’m headed to Australia in December but I’ll be in Melbourne maybe, hopefully they’re still flowering while I’m there. jacarandas are undoubtedly beautiful! i am a tree lover and the sight of a tree teeming with flowers is just overwhelming. i could stay under a jacaranda all day just admiring its its beauty. id love to be in the oxford street 🙂 the setting (although a whole lot better) somehow reminds me of an area along NLEX (i swear it’s also IG worthy but of course the blooms are not purple but golden yellow. im thinking hard about purple blooms in our country. i guess there’s none? except for hydrangea shrubs. and the trees with butterfly leaves. by the way do you know the cherry blossoms in benguet are also in boom since early this year? What are the flowers growing along NLEX? I don’t think I’ve seen them and now I’m curious. As with the cherry blossoms in Benguet, I’m trying to search for a photo to no avail. So beautiful. I am not able to decide which street is more beautiful and which one is less. Totally love the lavender spread everywhere. I will definitely keep your tip in mind and plan to visit Sydney in springtime. thb filipinos in Sydney are mayayabang. only few ang mababait. but Sydney is a nice city! kakamiss ang chilly weather nila and structures along Kingscross. Are they? That’s sad to hear. I didn’t really communicate with them so I can’t tell for sure. Lovely blog Majorie. Look at those beautiful spring full of jacarandas. Reminds me of Netherland’s tulips. I mean every destination gets so beautiful during the spring. Great that you didn’t give in to laziness and actually explored the place to get these beautiful shots of jacarandas. Thanks for the share! Now that you mentioned it, I actually don’t remember how they smell haha… I also eavesdropped a lot when I was in Sydney. Save for the couple whom I approached to take my picture, I didn’t really communicate with other Filipinos in the area. I just think it would be weird if I would suddenly chat them. Omg, Jacarandas are beautiful! With the names, description, I also imagined its smell. 😀 You have very lovely photos, I am not that fond of purple but this one is an exception! Good thing you were able to visit during springtime — just the right time for Jacarandas. Hmmmm looks like the Chinese = Bad tourists idea really do exist. Well about the jacarandas, it’s the first time that I’ve read about them. I’m happy to see that plants are getting the spotlight in today’s social media. In a few weeks the sakura would too. I’m excited to read more about your Australia trip. Thanks for sharing. Once again, Australia made me miscalculate the date. I thought you went back to Sydney just in time for the spring until I got to the last sentences of paragraph 1. Anyway, in defense of that one kababayan, perhaps she had unpleasant experiences with a few Chinese which stuck with her forever. Or maybe not and she’s just making an excuse, haha. What do you think about most Australias when it comes to their photos being taken by anonymous persons. I understand that in some countries, it’s a big taboo. In Japan, for example, most people don’t want their photos taken by strangers but they do have a lot of portrait photographers (with blogs and magazines) in Harujuku. Do you think the woman with purple hair would agree to have you take a photo if you were not afraid to ask? I’m not really sure how they feel about getting photographed. As with the girl with purple hair, she’s not Australian but a Korean (I heard her speaking with her companion). I don’t really make a habit of asking random people if it’s okay for them that I take a picture. I just don’t take their photo, I think it’s respectful that way. The only time they’re included in my photo is when they happen to be in the background or when I know for sure they are fine with it.